Having captured the imagination of homeowners across the globe, shabby chic is a style that promises to top the trend charts when it comes to interior design and decorating in 2016 as well. This is a style that combines comfort, elegance, a celebration of the past and modern overtones with seamless brilliance as you create a relaxing and ravishing home. From floral prints and fine antiques to flea market finds and sparkling chandeliers, shabby chic truly has it all! While we’ve already featured some of the best bedrooms, living rooms and kitchens that embrace this style, today we turn our focus to staircases. Obviously, the style of the staircase is defined as much by the materials used and the finish as it is by the décor and accessories that surround it. 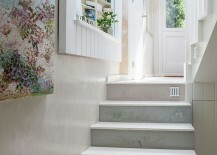 While it is harder to transform ultra-sleek, contemporary stairs in glass or polished stone into a shabby chic-inspired setting, traditional staircases can easily fit in with this look. 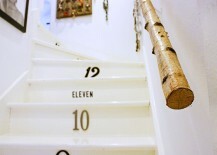 Even your existing stairway can be altered with some subtle touches to ensure that it becomes one with the shabby chic living room that you have just redone! 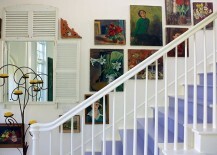 A great start here is the staircase wall filled with antique frames, vintage artwork and distressed décor. 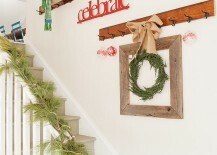 Creating shabby chic-style staircase walls is not always expensive, and you can do something as simple as picking up old photo and mirror frames from various garage sales and thrift stores. Just give them a common distressed finish, and you are good to go. Even empty frames can be used as stunning decorative pieces, and you can fill them up with DIY artwork over time. Remember that shabby chic is all about celebrating imperfection draped in inviting warmth! One thing you will notice about shabby chic is how this is a style where everything leads you toward a lifestyle that is less complicated, far more tranquil and devoid of the excesses. Color is a big part of this transformation, and it is often shades of white, lighter tones of gray, and of course the ever-present pastel hues that dominate the landscape here. 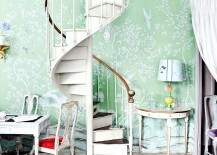 With pastels becoming a big deal in the world of fashion as well, homeowners are now more than happy to try them out. 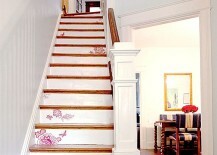 Whether it is custom wallpaper decoupage or just a lovely runner with a smart pattern, a bit of color adds to the aura of the shabby chic staircase. Do stay away from excessive pattern, though, as it leads to visual clutter and takes away from the serenity and simplicity that the style echoes. 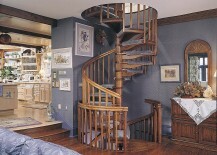 Does a spiral staircase have a style of its own? Absolutely! While some stunning spiral stairways seem distinctly contemporary thanks to the use of glass treads, others tend to veer toward rustic or Mediterranean style, as they predominantly use stone. But most traditional spiral stairs in wood are perfect for the shabby chic space, and it is by simply altering the space around them that one can automatically alter the style of the stairway as well. 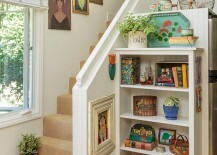 In the inspirations below it is antique décor, vintage accessories and wallpaper that get the job done, while the space-saving staircase is left completely unaltered. One aspect of shabby chic that can quickly polarize opinion is the amount of white that it often relies on to weave together the aged, upcycled, revamped and modern elements that it showcases. Some of us absolutely love this part, while others strongly detest it. If a white stairway wall seems a bit too boring for you, add a hint of pastel pink, gentle blue or even calming coral to the mix. Walls finished in Venetian plaster are a smart alternative as well, as they bring texture to the space without altering the color scheme or the aura of timelessness. 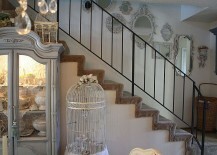 As you might have realized by now, a shabby chic staircase is a blend of the right materials, finishes and a setting that allows you to express its beauty in an unabated fashion. Classic chandeliers and a healthy dose of natural light are the final ingredients that complete this delectable style that allows you to move away from the mind-numbing boredom of the urban jungle! 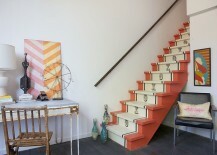 Thanks Decoist.com for a fabulous article!